The Tesla of the trucking industry is getting Model 3 level hype. 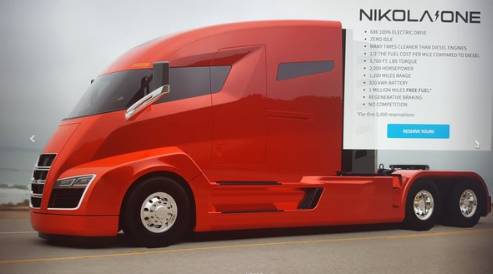 Nikola Motor Company — called the Tesla Motors of the trucking industry for its electric vehicles and that famous first name — announced a whopping 7,000 reservations with deposits for its electric hybrid “Nikola One” semi-truck today. If all of the orders are actualized, that represents $2.3 billion in revenue since the model was announced last month. Intense reservation hype over a yet-to-be-seen electric vehicle probably sounds like deja vu to you, and for good reason. Nikola Motor is pulling a move straight out of the playbook of the more famous company named after Nikola Tesla. Only, Nikola Motor isn’t trying to bring electric vehicles to the masses, it is trying to use electric vehicles to bring products to the masses. “We believe we will pass the current market leaders like Daimler, PACCAR, Volvo and Navistar in sales orders within the next 12-24 months,” Nikola Motor CEO Trevor Milton claims in a press release. He also says that some of the top class 8 dealerships in America have reached out and are willing to either “add our brand” or move away from their existing brands. The Nikola One costs $375,000, or can be leased for $4,000 to $5,000 per month. It focuses on a different market than Tesla, but it surely isn’t shying away from the comparisons.